Economic news softened somewhat from my last update. The most recent readings for employment (as measured by the non-farm payrolls report) showed a slightly weaker pace of growth. Additionally, much of the bounce in the Institute for Supply Management’s Manufacturing Index was given back last month. However, we should not exaggerate the weakness. The current situation in the US economy seems to be self-sustaining demand in the US but with ongoing weak international growth. 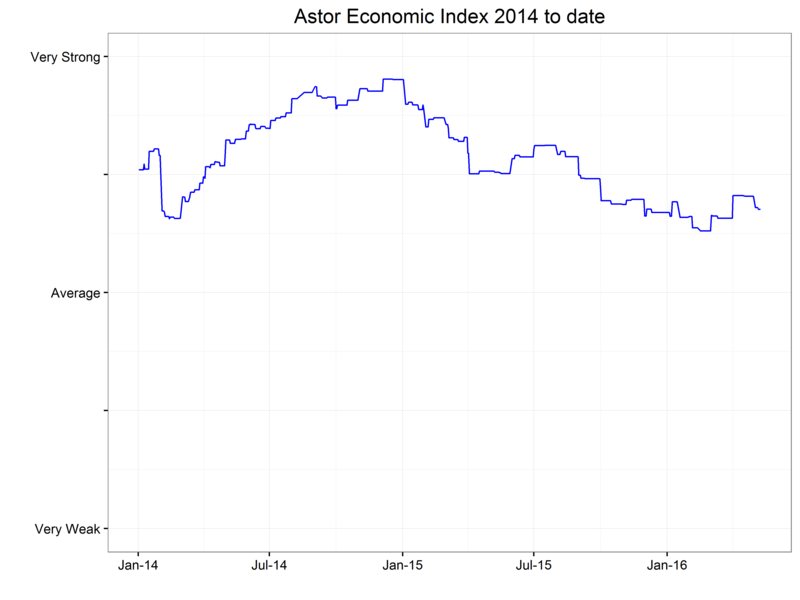 Our Astor Economic Index® (“AEI”) shows growth levels marginally above the recent lows posted in February, though a bit weaker than a month ago. The AEI is a proprietary index that evaluates selected employment and output trends in an effort to gauge the current pace of US economic growth. The chart below shows the last few years of this gauge which has been in a trendless range over that period. The GDP print at 0.5% for the first quarter was weak. We trailed this possibility last month based on predictions from the nowcasting models published by the Federal Reserve Banks of New York and Atlanta. These models, with very little live data, are currently showing only modest improvement in the second quarter, about 0.8% at an annual rate. The headwinds from abroad continue. 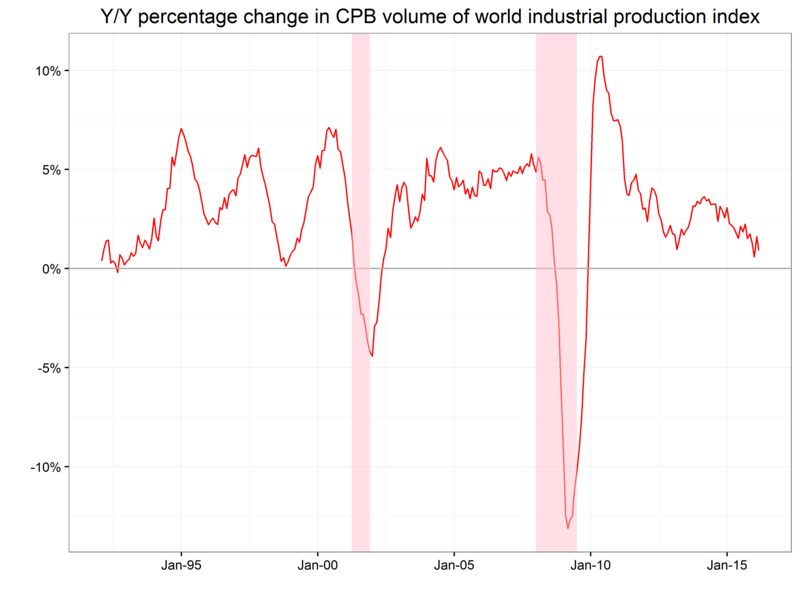 The chart below shows the year-over-year percentage change in the volume of world industrial production (as calculated by the CPB Netherlands Bureau for Economic Policy Analysis). That is, this index is supposed to ignore currency changes so it should be a bit more steady than market prices. The deterioration in the last few years is obvious but, as of now, has avoided the unremitting declines associated with the 2001 and 2008 recessions and is still showing that world industrial production is increasing year on year. However, stagnant growth combined with the strong dollar makes for an external environment unlikely to boost growth this quarter. The lack of follow-through from the previous month may make it difficult for the Fed to raise rates again at their June meeting, but expect speeches from FOMC members to try to keep the dream of hiking alive. However, the market is having none of it as Fed Funds futures are currently forecasting no change in June. Overall I expect more of the same positive but tepid growth in the weeks ahead. All information contained herein is for informational purposes only. This is not a solicitation to offer investment advice or services in any state where to do so would be unlawful. Analysis and research are provided for informational purposes only, not for trading or investing purposes. All opinions expressed are as of the date of publication and subject to change. Astor and its affiliates are not liable for the accuracy, usefulness or availability of any such information or liable for any trading or investing based on such information. The investment return and principal value of an investment will fluctuate and an investor’s equity, when liquidated, may be worth more or less than the original cost.